The Hirshhorn Museum and Sculpture Garden has announced the acquisition of 30 major new works, including a significant gift from the former Corcoran Gallery of Art. The collection of works from the Corcoran represents a number of seminal figures in contemporary art, including Sam Gilliam, Robert Gober, Petah Coyne and Harvey Quaytman, among others. Additionally, after overwhelmingly successful exhibitions in 2018, works by artists Charline von Heyl and Georg Baselitz will also enter the collection, rounding out the museum’s holdings in contemporary German and American painting. The Corcoran Gallery of Art in Washington, D.C., was founded in 1869 as one of the first fine art galleries in the country; upon its closing in 2014, the Gallery’s collection of 17,000 works was placed under the care of the National Gallery of Art, with the intention that the majority of its holdings would be distributed among peer institutions. As part of this initiative, the Hirshhorn will inherit a grouping of 10 works of key significance throughout the latter part of the 20th century, which will build upon the existing strengths of the museum’s collection in postwar abstract painting, print-making, conceptual photography and sculpture. As part of the Corcoran gift, two major works by the pioneering Color Field painter Gilliam will join the Hirshhorn’s current holdings of the artist’s work. “Light Depth” (1969), which has particular significance in Washington, D.C., was commissioned by the Corcoran on the occasion of the gallery’s 1969 exhibition. The piece responded directly to the building’s architecture, bridging two connected walls with a gentle curve in between. The second work entering the collection, “Level One” (1994) is a later work from Gilliam’s Rake series and features a dynamic and richly textured surface of thickly layered paint. American sculptor Coyne, best known for her dense, material-rich oeuvre that demonstrate an almost baroque sensibility of form, creates works that are infused with personal histories, such as film and literary references in addition to everyday life. “Untitled #785” (1994) was created during a period when Coyne worked with a specially-formulated white wax. Greek-born, American artist Chryssa was a pioneer in the field of light sculpture. Her work “Clytemnestra” (1967) consists of eight concentric neon forms, intended to evoke several performances by other artists that the Chryssa had experienced herself. Additionally, Liz Deschene’s photograph “Beppu” (1996-1997) is part of an early series of images produced in the Japanese resort town of Beppu, on the island of Kyushi. The work demonstrates the artist’s unique investigation of a traditional artistic formats, such as landscape. Other acquisitions from the Corcoran include Quaytman’s “Blue Butter” (1969-70), an imposing early work that incorporates a painted, wing-shaped canvas and a wall-mounted brace comprising two L-shaped brackets installed back-to-back. The piece remains loyal to Quaytman’s practice of modernist abstraction, creating a large arrangement that overwhelms viewers both in stature and presence. Jim Sanborn’s “Lux, Lux, Lux” (1990) connects several interweaving themes of the Washington-based artist’s oeuvre, including light projection, code and the natural world. In this work, a ceiling-mounted light projector casts text over the surface of a small, upright block of petrified wood, combining the artist’s interest in nature and artifice. Lastly, three lithographs by the iconic American artist Gober, all entitled “Untitled” (2000), will be acquired from the Corcoran’s collection. Working across various media, including sculpture, photography, drawing and printmaking, his works often focus on overlooked objects of the everyday. These works include a number of longstanding motifs Gober has returned to again and again throughout his career: the drain, text and the “prison window,” a small window set high on a wall with bars at the front and a blue sky visible below. Additional works entering the collection include Moath Alofi’s, “Mihlaiel” (2018) and “The Last Tashahhub” (2017); Dana Awartani’s “I went away and forgot you. A while ago I remembered. I remembered I’d forgotten you. I was dreaming.” (2017) and “Listen to My Words” (2018); Georg Baselitz’s “Zero Ende (Zero End)” (2013) and “Untitled” (2018); Zhang Dali’s “2001 41A” (2001); Jessica Diamond’s “T.V. Telepathy (Black and White Version)” (1989); Zhang Huan’s “Untitled” (2006); Yayoi Kusama’s “Pumpkin” (2016); Tony Lewis’ “Anthology 2014-2016” (2014-2016); Helen Marten’s “Evian Disease” (2012); Ahmed Mater’s “The Empty Land” (2012); Donald Moffett’s “He Kills Me” (1987); Jill Mulleady’s “Mother Sucker” (2017); Shirin Neshat’s “Untitled” from the series Rapture (1999); José Santos III’s “The Order of Things (no. 3)” (2017); Avery Singer’s “Untitled” (2016); Charline von Heyl’s “Mana Hatta” (2018); and Tsuruko Yamazaki’s “Work” (1957). This series of acquisitions represents an important moment for the Hirshhorn. With works that both demonstrate and reflect upon the artists’ contributions to the discourse of contemporary art, to works that provide opportunities to further build upon pivotal moments in art history, these acquisitions within the context of the Hirshhorn’s collection will continue to examine and shape the ways in which art can speak to the greatest issues of our time. The Hirshhorn Museum and Sculpture Garden is the national museum of modern and contemporary art and a leading voice for 21st-century art and culture. Part of the Smithsonian, the Hirshhorn is located prominently on the National Mall in Washington, D.C. The collection includes major holdings of painting, sculpture, photography, mixed-media installations, works on paper and new media, making it one of the most important collections of postwar American and European art in the world. The Hirshhorn presents diverse exhibitions and offers an array of public programs on the art of our time—free to all, 364 days a year. For more information, visit hirshhorn.si.edu. 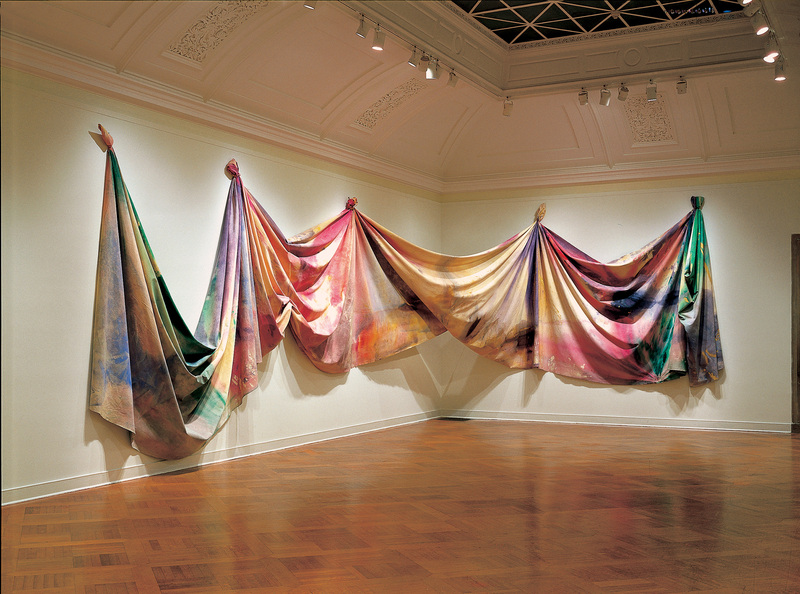 Image: Sam Gilliam, “Light Depth,” 1969. Acrylic on canvas. Courtesy Corcoran Gallery of Art. Gift from the Trustees of the Corcoran Gallery of Art (Museum Purchase, Gallery Fund), 2018.